Previous Story DxOMark reviews the Canon EOS R: How does the 30.3-megapixel sensor fare against its peers? 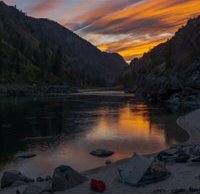 Photographer and educator Dave Morrow has captured a lot of landscape images over the past year. His video content is often focused on specific skills, either photography skills out in the field or on the outdoors skills he requires for his trips. He is a proponent of waiting to edit and post his images, because he finds that waiting is more conducive to the creative process. In fact, when he captures images, they go into a Lightroom folder for review. The images typically sit, untouched, in that folder for three to six months. After that, Morrow will select the images he thinks are good from that original folder and put them into a folder for processing. If he doesn't like it, he tosses it. By waiting at least three months, Morrow is able to separate the image from the overall trip and evaluate it on its own merits. There are images in his "ready to process" folder that are from as far back as 2014. In the video below, Morrow goes through a variety of the images awaiting processing and discusses where he was, the thought process behind the image and what he may end up doing with the image as he processes it. Morrow has a large library of amazing tutorials and educational resources available here and you can click here.